SECDET IV had a Vehicle Borne Improvised Explosive Device (VBIED) detonate across the street from their HQ during their tour. SECDET IV was also involved in a serious accident when an ASLAV rolled at high speed. 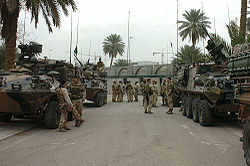 SECDET V was involved in a VBIED attack on 25 October 2004, just short of an International Zone checkpoint, with the patrol suffering four wounded in action and serious damage to an ASLAV-25. SECDET V was also involved in two incidents in the northern city of Tall Afar on 8 and 10 December 2004, when 3 Troop, A Squadron of the 2nd Cavalry Regiment was ambushed by insurgents using small arms and rocket propelled grenades. During the subsequent firefight, the insurgents suffered injuries and casualties, however no damage was inflicted on the Australian patrol. SECDET VI had a VBIED detonate both on an ASLAV patrol on Route Irish and also on their HQ in Baghdad during their tour. Private Jacob Kovco, Australia's only fatality of the Iraq conflict, was a member of SECDET IX in 2006. V32- C Squadron, 2nd Cavalry Regiment. ^ "Australia withdraws troops guarding Iraq embassy". ABC News. 10 August 2011. Retrieved 10 August 2011. ^ Wiseman, Nick (18 August 2011). "Security shift". Army News: The Soldiers' Newspaper. Edition 1265. p. 19. Retrieved 23 August 2011. ^ a b c Callender, Garth (July 2015). After the Blast. Black Inc. ISBN 9781863957380. ^ a b Box, Dan (July 2008). Carry Me Home: The Life and Death of Jake Kovco. Allen & Unwin. ^ a b c d e f g Horner, David; Bou, Jean (2008). Duty First. A History of the Royal Australian Regiment. Sydney: Allen & Unwin. p. 332. ISBN 978-1-74175-374-5. ^ a b "JTF 633: Iraq Ops". Australian & NZ Defender. Brisbane: Fullbore Magazines (50): 16. 2005. ^ "Cheers for boys from Baghdad". Army News: The Soldiers' Newspaper. Army. 2006-04-20. Retrieved 2008-09-15. ^ a b c "Op Catalyst Iraq". Australian & NZ Defender. Brisbane: Fullbore Magazines (55): 14. 2006. ^ McBean, Graham (2007-03-08). "Keen for Iraq tour". Army News: The Soldiers' Newspaper. Army. Retrieved 2008-09-15. ^ Hetherington, Andrew (2007-08-23). "Secdet set for deployment". Army News: The Soldiers' Newspaper. Army. Retrieved 2008-09-15. ^ "Iraq". Australian & NZ Defender. Brisbane: Fullbore Magazines (63): 6–8. 2008. ^ "JTF 633 - NAG & Iraq". Australian & NZ Defender. Brisbane: Fullbore Magazines (64): 46. 2008. ^ a b "SECDET Security Detachment Baghdad". Australian & NZ Defender. Brisbane: Fullbore Magazines (66): 6. 2009.